I’m not an artist, in spite of my brother once telling me I painted with words. That was the kind way of saying that attempts at drawing sucked. I even bought a book on how to draw with pencil. I mean, if I can write with a pencil surely I could draw with one. Right? That ended up being an excuse to buy some nice pencils and cool leather-bound books with parchment to hold all the drawings. Nothing was unrecognizable. And I followed the directions! Added to the lack of drawing ability, I also am terrible at colors. No clue what goes together. When it was time to paint our house the only reason it came out good is that I got one of those little paint booklets that tell you what colors to put together. Since our house was built in 1928 I went with the ‘Historic Collection’. With that background, you’ll understand my frustration with book covers. I have a wonderful cover artist, but she can’t read minds, unfortunately. For the upcoming Ghost Roads, I knew I wanted to hint at the mystery, I knew I wanted to tell a story, and I knew I wanted something to grab the eye. 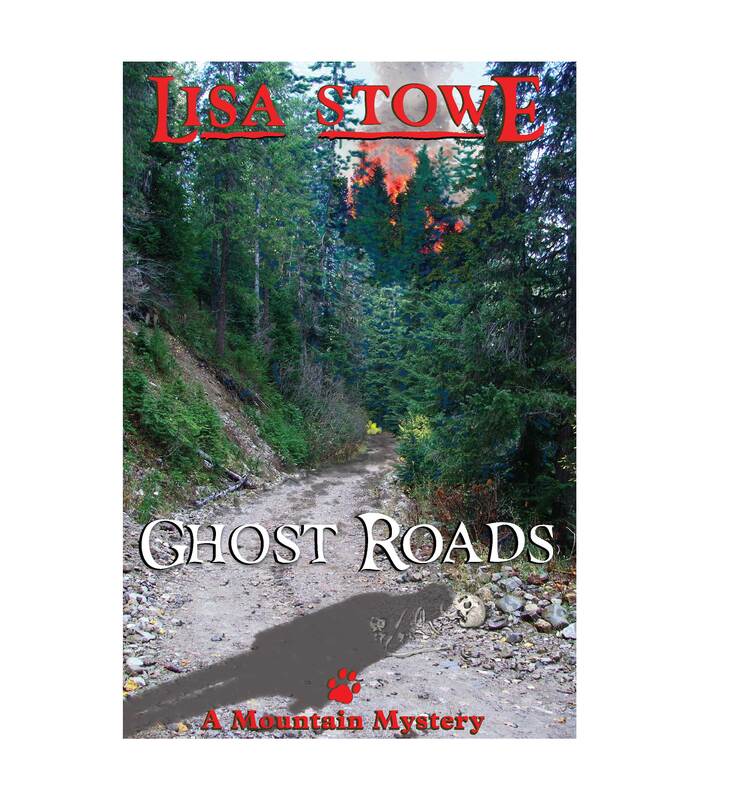 Using story elements from the book, I asked the cover artist to put a forest service road going up into woods that were on fire, with a skull or bones in the road, and a feminine shadow overlying the bones. I got the rough draft last week. I loved the way she did the fire. Everything else? Not so much. And it’s taking me a long time to figure out why, so I can tell the artist and not waste her time. I doubt she’ll appreciate things like ‘Oh, I don’t know. Something’s not quite right.’ Or ‘Could you maybe start all over?’ Or even, ‘You did what I asked for but now I don’t want it anymore’. To avoid being fired by my cover artist, I have struggled to figure out what I don’t like about the artwork. And I’ve come up with this. A cover should be a short story, not a novel. I believe I’ve put too many elements into the cover. As my editor, author Susan Schreyer said, the eye doesn’t know where to look. As my publicist who’s building my website said, ‘Hey, a Nancy Drew!’ And trust me, he wasn’t saying that in a complimentary fashion. He was laughing pretty hard, actually. I also wasn’t wild about the fonts used. My publicist thought, ‘Nancy Drew’. I went more with ‘Scooby Doo’. I’ve responded finally to the cover artist, who was getting worried by the internet silence. After she has done all this work doing exactly what I asked for, I’m now asking her to shift it all around and remove some elements. The thing is, I still don’t know if what I’m asking for is the right thing. After all, my idea of painting is paint-by-number. Or tracing. I can trace. Anyway, the changes should hopefully be a short story and we’ll see how version two goes. Oh, and I did offer to pay her more since I’m being a problem customer. First attempt at Ghost Roads cover. Love this one, even as is – aesthetically pleasing and attractive. For your title though, it could be alittle more “smeary” – that road is SO ragged clear I am sore all over just remembering the many miles I’ve walked such roads and how HARD all those rocks are. I thought ghosts were about soft, not quite visible, mystic, kinda heebee jeebee??!! You need a password? How come I don’t know that? Hope you still pet sit next summer; we may need you. How’s the poetry coming along? I’m always glad when you show up here since we don’t see each other at writer’s groups anymore. A groupie. How funny. Why am I not surprised? What about taking out the shadow person. Coming a little closer to the distant part of the road? I think that’s what I’m going to do. When you look at the thumbnail the shadow is the most visible portion of the cover. And thumbnail is the size most e-book readers see. But still, I think my biggest issues are the shadow and the font of the title.